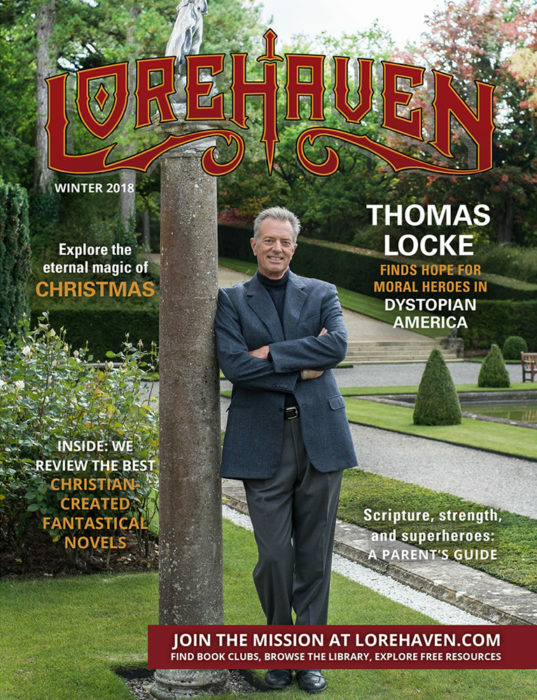 Lorehaven Magazine seeks to serve Christian fans with book reviews in each issue. First, you get a short, convenient flash review of a recent Christian fantastical novel. We’ll describe the characters, plot, and world. You’ll get an idea of what themes the story explores. You’ll notice, however, that we don’t offer star-based rankings or thumbs up/thumbs down. Sure, some stories have objectively good or bad traits. But we hope to review only the best stories, and match these with the best fans. Second, under Best for, we identify kinds of readers we believe will love the story. Third, under Discern, we offer a short list of story elements worthy of discussion. Please note that the term “discern” does not mean we must always avoid story elements, such as certain words or themes, because we find them offensive. In Christ, we have the option of freedom to engage with any story as in-training members of Jesus’s church family. Some readers, however, may need to avoid a story if it will tempt them personally to sin. In that case, we feel these elements are worth discussion as fans help each other to find truth in fantastic stories. In your family or church, mature readers may need to read the novel first, then help other readers engage it with truth and imagination. Authors can share their books at Lorehaven.com. Our volunteer team will match qualifying entries to the reviewer who is best suited for each kind of story. We also prioritize newer novels, so we will consider a book’s date of release. Authors can also consider sponsored (or paid) reviews for older books, or books we otherwise can’t select for volunteer review. We treat each sponsored review just like any other review. To learn more, reach out by email to reviews@lorehaven.com. Is the book suitable for Lorehaven review? All three must be honestly marked "yes" for review consideration. Share more about your story. New subscribers only: Confirm your free subscription?